For Mufaro Chakabuda, dancing is a passion, a livelihood and a connection to her Zimbabwean home. Her hands fly in the air. Her feet move deftly. Her legs rise, then softly pad into the ground at just the right moment. The music seems to flow right through her. Audience eyes take in Mufaro Chakabuda’s movements and are rewarded with not only the wonder of the human body before them, but with a smile of joy that stems from doing what one was born to do. For most of us, dancing is a hobby, a past-time, a way to exercise. “For me, it’s more than that. It’s connection to my ancestors. For me, to be Zimbabwean is to dance,” says Chakabuda. Dancing has taken Chakabuda to many places—it’s even gotten her an invitation to the Olympics. “I was overjoyed. Over the moon when I heard the news,” she says. Funding for the trip has fallen through, but the honour is still there. Despite her successes, Chakabuda always remembers the simple beginnings of her dance love affair. As a child, she’d get caught up in the sound of the drums, the feel of the earth beneath her feet and the energy of those around her. Chakabuda remembers an aunt’s wedding. She was four years old. “Ain’t nothin’ but the rent” blared from the speakers. Thousands of people were in the hall. Solo, Chakabuda walked onto the dance floor in her little frilly dress with white socks and shoes, her hair in ponytails, and she danced. She can’t stop smiling as she remembers her aunt hugging her, her father telling her she was doing it right, her mother telling her dance was always going to be a big part of her life. About 10 years ago, Chakabuda moved to Canada to go to Dalhousie. It was hard being away from home. She danced, sang and drummed in her dorm room. “It helped fight off the waves of sadness,” she says. “It was a way to be acquainted with Zimbabwe.” She laughs, throwing back her head. “A way to say, ‘hello.’” When she finally broke away from her dorm, Chakabuda started teaching others about her cultural joy. Dancing became her passion. After leaving Dalhousie, Chakabuda had to decide what would come next. She’s always had a second love in her life: entrepreneurship. She started teaching classes at the YMCA. The success of the classes prompted her to combine her two loves. But four years later, things were looking up. Chakabuda was holding workshops across the country. She had 35 employees and government-funded sponsorships for 25 out of the 45 students enrolled in every dance camp she held. She usually found sponsors for most of the other children. She was making it. Chakabuda was about to see how true that really was. It was the fall of 2008. Walking along Gottingen, her voicemail beeped. Casually, Chakabuda took out her phone and began to listen. “We would like to invite you and your group…” She doesn’t even remember hearing the rest of the message. Want to dive into stories that explore the core of a woman during those moments in life that make her or break her? 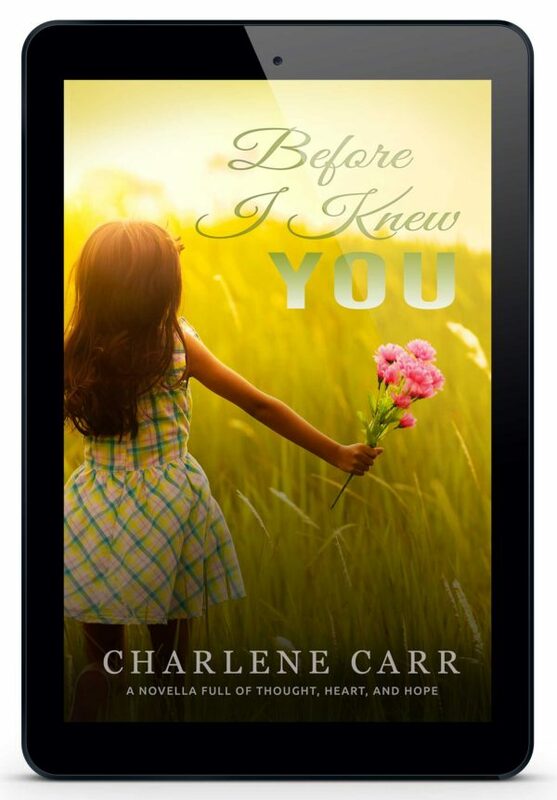 Get started with a free sample of my novella, Before I Knew You, a story about a woman struggling to fulfill the greatest desire of her heart. You'll also have the option to join my mailig list and get updates about my books and writing life. Your information will never be shared or sold to a third party. Unsubscribe at any time. Please note - you do not have to confirm your subscription in order to get a copy of the novella. I’m a lover of stories. Reading, writing, watching, listening, telling … If it’s a tale that involves realistic characters and true-to life interactions, I’m all about it. Did you get your free novella yet? All of my stories explore the core of a woman during those moments in life that make her or break her. Get started with a free copy of my Novella, Before I Knew You, a story about a woman struggling to fulfill the greatest desire of her heart. You'll also have the option to join my mailing list and get updates about my books and writing life. I will never sell or share your email address. Unsubscribe at any time. Please note, you do not have to confirm your subscription in order to get your free Novella.